Once is a glorious, intensely romantic musical. It tells the old story of boy meets girl – literally Guy meets Girl – through a sequence of memorable, well-crafted songs. This is not a musical about special effects or spectacular sets and costumes, but merely true-to-life, complex emotions communicated through music. Lately, one might have thought that modern musicals had forgotten this, but Once proves that a musical centred on character, music and emotion not only is still possible but can hold an audience spellbound by its beauty. Based on the 2006 Irish film of the same name directed by John Carney, Once tells the story of the Dublin busker Guy (Stuart Ward), who wants to gives up his singing and songwriting because of the depression he is in following the breakup with his girlfriend who has now moved to New York. Hearing the last song he sings before he decides he can’t go on is Girl (Dani De Waal), a young Czech woman who lives in Dublin with her family. Since Guy insists he is just a vacuum-cleaner repairman now, not a musician, Girl mentions that she happens to have a vacuum-cleaner that doesn’t work. Girl’s faith in Guy eventually drags him out of his doldrums to the point that he is willing to make a demo of his songs in hopes of getting signed to a record label. With his advance he can buy a ticket to New York and try to win back the girl who left him. By this time, Guy’s thankfulness to Girl has turned to love, though Girl feels he is really still in love with his girlfriend in New York. On her side, Girl’s altruism in helping a young man not abandon his talent has also turned to love. But there is one major obstacle to her giving in to her emotion – she is still married to the father of her daughter who has returned to the Czech Republic. Girl’s project in helping a stranger hold on to his talent may seem too good to be true. But Girl comes from a musical family. Her father committed suicide when arthritis prevented him from playing the piano, and she wants to prevent Guy from committing a kind of creative suicide. At the same time, as the title and the generic names of the main characters suggest, there is the quality of an urban-set fairy-tale to the show that gives the specific situations of the characters a universal significance. Given such a romantic story director John Tiffany, whose work was last seen in Toronto in his fantastic production of Black Watch in 2008, has chosen to direct it in a Brechtian style so that we are always aware that we are watching actors staging a musical. From John Doyle, whose revolutionary Sweeney Todd played Toronto in 2007, he borrows the idea of having the actors double as the orchestra. Singers accompany themselves on their given instrument. Sometimes the others, who are visible at the sides of the stage at all times, join in vocally, instrumentally or both. Sometimes they do not. Often Tiffany uses the others’ participation as a sign that something in the main story has struck a chord (literally) with those who observe it. In one wonderful sequence Guy performs unwilling at a talent night before a skeptical crowd. One by one we see them won over by Guy’s song “Gold” and take up their instrument to play along so that by the end all twelve actors on stage are playing and singing Guy’s song united in music, united as a community. This impression is reinforced in Act 2 when the whole company sings “Gold” again in an incredibly moving a cappella version that suggests that Guy and Girl’s story has changed the lives of everyone. Though the story takes place in several locations in Dublin, Tiffany has staged all the action inside Bob Crowley’s detailed replica of a rundown Irish pub. To enhance the illusion, the public is free to walk on stage before the show and at intermission and order drinks at the bar. Yet, naturalistic though the set may be, the curtain has been raised to its full height so that we see above the top of the set to the back walk of the theatre and can never escape the Brechtian notion that the set is only a set. Further to this, all the locations needed in the musical are represented only by chairs and tables placed in different arrangements within the pub setting. The scene changes are cleverly choreographed to instrumental music payed by the all the actors not involved in moving the furniture. Adding to the non-naturalistic presentation of the story, all scenes, even those depicting the characters “alone”, are witnessed or even accompanied by the other onstage cast members. While this means we can never escape the notion that we are watching a musical being staged, it also has the curious effect of suggesting that the whole pub community is re-enacting a story that touched them all. The music of Once is far removed from that of most Broadway musicals. Given that the central figure is an Irish singer/songwriter, all the songs have the introverted quality of personal expressions of emotion rather than the extroverted Broadway hallmark of celebrating oneself in front of a multitude. The music, whether from Irish or Czech characters, all belongs to the categories of folk, folk pop or alternative folk. Though the exquisite “Falling Slowly” may be the most famous song of the musical, they are all memorable, including the Bank Manager’’s purposely awful song “Abandoned in Bandon”, and, except for that song, radiate a quiet strength and beauty. This makes Once quite unusual as a very “lo-fi” kind of musical. Yet, life is not all spangles and kick-lines, and you will find yourself fully caught up in the bittersweet atmosphere of the characters’ conflicting emotions. Stuart Ward gives an ideal performance both as actor and singer of a man brought from the brink of despair and given the chance to believe in himself again. His depiction of the arc from pain to joy is not just believable but deeply moving. Dani De Waal also is perfect embodiment of Guy’s personal angel, who also happens to be a human being. Her Czech accent is spot on and her chirpily optimistic view of life at first seems unrealistic until we realize that doing Guy a good deed also helps brighten the dark corners of her own life. Once we see that we feel as much sympathy for De Waal’s character as we do for Ward’s. The ten other cast members, not including Kolette Tetlow, who plays the silent role of Girl’s daughter, all create vivid characters. Evan Harrington, the half-Spanish half-Irish pub owner never overdoes his role as the show’s principal comic character. Benjamin Magnuson his very funny as the Bank Manager, so inspired by one of Guy’s songs that he inflicts one of his own compositions on Guy and Girl much to his own embarrassment. Raymond Bokhour is an earnest pretence as Guy’s Da, still mourning the death of his wife. He makes the scene where Da supports Guy in his decision to leave home one of the most moving in the show. Donna Garner is a stern figure as Girl’s mother Baruška, but allows us to see a whimsical side to her that helps explain Girl’s own nature. Once is a musical quite different from any other. The genre and quality of its music, its innovative staging, its emphasis on atmosphere as well as character inspires a warm contemplativeness in the audience which is certainly the opposite of what most musicals aim for. Once proves that a musical that is relaxing and sensitive can affect us more deeply than the many that are raucous and outrageous. The wistful mood it engenders makes it an ideal show to see with someone you love. Try to arrive at the show early to catch the riotous party of pub songs and dances played on stage by the ensemble before the lights dim and the musical itself begins. 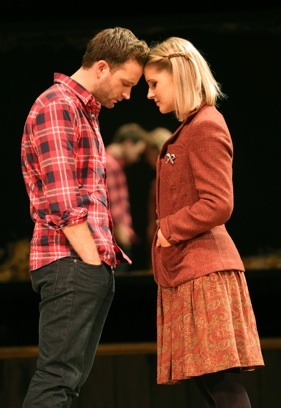 Photo: (from top) The ensemble of Once;Stuart Ward as Guy and Dani De Waal as Girl. ©2013 Joan Marcus.